2018 has been a great year with lots of ups and a few downs but overall I can’t complain. I could make some huge improvements in my training and most important of all I had a year without any noteworthy injuries. The competition season could’ve gone better, although I felt strong and confident there was always something missing to move on to the next round. On the other hand, I guess it could’ve also gone worse and the field just gets so much stronger year by year. There’s still lots of things to work on and I’ll try my best next season! My personal highlight was finally completing Frogger (8A) in the beginning of the year, a boulder I considered my longterm project. 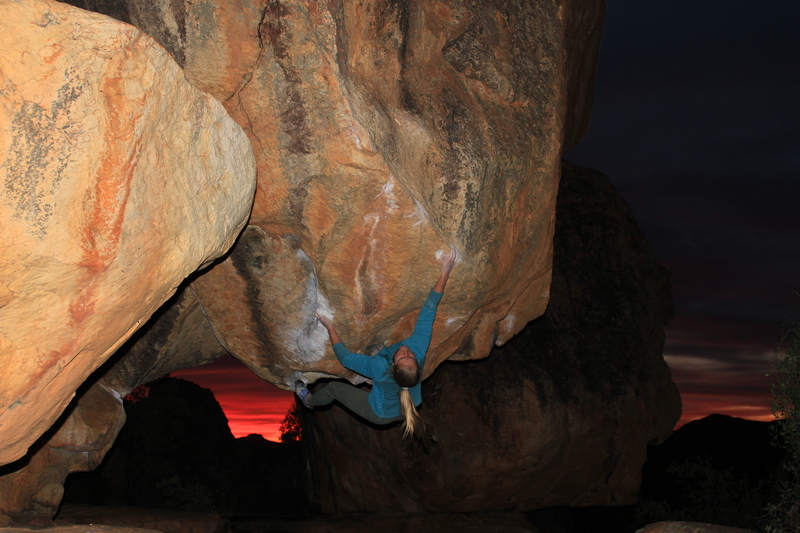 My most emotional climbing moment of the year however, was the night I almost climbed Black Shadow (8A+). Almost. But I messed up the end. Pretty badly. I still get goosebumps thinking about it and watching the video makes me wanna cry. Yet I’m also a tiny bit proud at the same time and the determination to finish it is bigger than ever because now I’m sure I can do it. In theory, this one is relatively easy. Make a plan, train hard and get stronger. Unfortunately it doesn’t always work that way. Every body works differently and it takes a lot of experience to figure out what works best for yourself. Plus it takes a lot of discipline and good time management to stick to that plan. Sometimes work or school gets in the way or you just really don’t feel like training that day. That’s when it really helps to have a motivated crew around you. Some projects require very specific training and it sure helps to try and rebuild that crux sequence at the gym but some moves are just so unique this is easier said than done. Personally, I think the best way to train for a project is to actually climb on it as much as possible. This one’s a bit tricky. Usually I perform at my best when I don’t have any expectations. Yet how can you spend countless sessions on a boulder and not have any expectations? Yeah right. Even when I feel close and it has to be just a matter of tries I sometimes reach a mental barrier. That’s when it usually helps to take a break, try something else and just climb. After all, it’s JUST a boulder problem and your mind should be allowed to think about something else every once in a while. This is the one essential factor you can’t control. Of course you can feel well rested with fresh skin and all but I always underestimate conditions. In some climbs it’s less important than in others but that little bit of wind and a few degrees less can make all the difference. I tried to tell myself otherwise and often tried with conditions being less than favorable but I just ended up doubting my abilities and loosing confidence. Well whatever, that’s a wrap and enough of my babbling. I hope you all had a wonderful 2018 and I wish you an even better 2019! Keep working hard, have fun and get out there! Oh also, I made a little video of our trip to South Africa and I finally found the time to edit some footage from Magic Wood last year, hope you enjoy! Rocklands 2018 from nat on Vimeo.